Day 01 – Arrive Kathmandu. Meet at the airport and transfer to hotel. Day 02 – Sightseeing tour of Kathmandu, including the Durbar Square, the Temple of Living Goddess and the Royal Palace. You will also visit Kasthamandap, a temple built from a single tree and from which the city Kathmandu derives its name. Continue for a visit to Swayambhunath, the oldest Buddhist shrine, said to be 2000 years old. 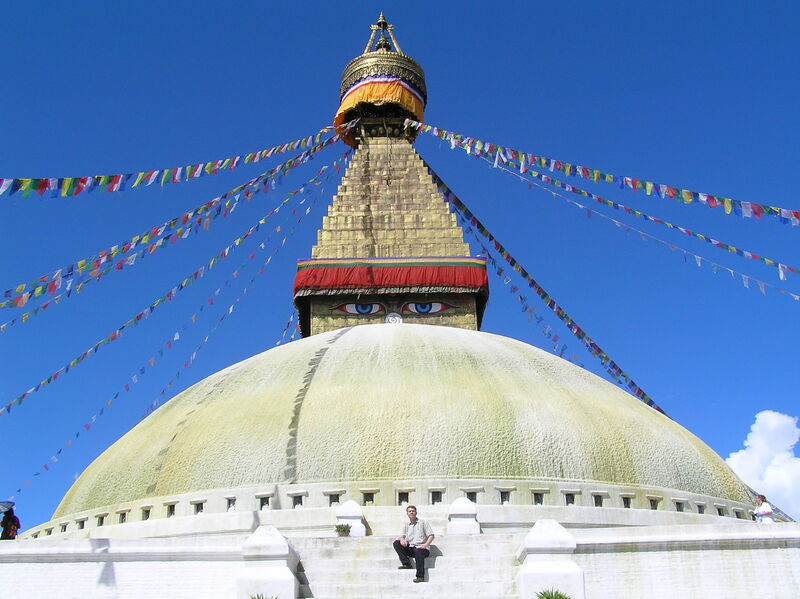 The stupa is situated on a hilltop with breathtaking views of the city. Looking east from here one can see the entire Kathmandu valley spread out below. This afternoon we visit the Budhanilkantha, about 8 kms north of Kathmandu. It is remarkable, colossal statue of Lord Vishnu, reclining on the coil of the snake king. This 5th century statue is in the middle of a small pond and appears to float on the water. It is a famous place of pilgrimage, though the reigning King of Nepal may not visit this spot. Day 03 – Travel to Patan City, an artistic and architectural jewel founded in 250 AD, and previously known as Lalitpur. Sometimes it is known as the “Town with a Thousand Golden Roofs.” Here we shall visit the Durbar Square, Royal Baths, Mahaboudha, Krishna Mandir and Hirayana Mahabihar Temple (The Golden Temple). We also visit a Tibetan Handicraft Centre. Day 04 – Travel to the typical Newar village of Bungmati. Founded in the 7th century, Bungmati is home to one of the most important Gods of the Kathmandu Valley known as Matsyendranath, the God of Rain and compassion, worshipped equally by Hindus and Buddhists, and accredited by local people with the introduction of rice plantations in the valley. The rich heritage and relatively unchanging lifestyle of the Newar people is clear to see both in Bungamati and in the nearby village of Khokana, which we also visit. On the southern edge of the Kathmandu valley, the mighty Lichchhavi rulers of Nepal established Khokana in the 7th century, and remains relatively isolated from modern Nepali life. Day 05 – A full day at leisure in Kathmandu allows time to relax, shop or visit other sites of interest such as the National Art Gallery, Balaju Water Gardens and Godawari Botanical gardens. Day 06 – This morning we visit the medieval city of Bhaktapur, also known as Bhadgaon. It is situated about 17 kms. East of Kathmandu and was one of the three kingdoms of the Mallas. Here we shall visit the Lion Gate, Picture Gallery, beautiful embellished Golden Gate and 17th century Palace of Fifty fife Windows. The city’s ancient temples and palaces are magnificent examples of Newari craftsmanship with their beautiful carved wooden windows and lattivework, and Bhaktapur’s people are still renowned for their pottery and hand woven fabrics, including the traditional local red and black saris. Day 07 – Today we travel eastwards to Changu Narayan. Situated at the end of a long ridge that runs well into the valley, it is said to have be the oldest temple in the valley, built in 323 AD by king Hari Dutta Varma. The temple is richly decorated with sculptures and carvings, and its position above the Kathmandu Valley affords a beautiful view of the surrounding countryside. Day 08 – Today’s explorations are to the west of Kathmandu, visiting the temple of Dakshinkali dedicated to Goddess Kali “The Terrifying” and where pilgrims congregate regularly. The temple is surrounded by lush green forest of trees and the area is a popular picnic spot for local people. We also visit Pharping with its shrine of Shekh Narayan that is richly endowed with history and art. This picturesque shrine stands on a small hill, and the pools below the shrine abound with fish. Our tour continues to the Chovar Gorge, said to have been created when the Chinese god Manjushree struck his sword upon the hills to drain the vast lake that legend says filled the Kathmandu Valley. On the top of the hill stands a picturesque pagado dedicated to Adinath. From here there are yet more fantastic views of the snow –capped mountains peaks. On our way back to the city we visit Kirtipur, a delightful medieval village, sited on a low hill. The village people still wear traditional costumes, and we shall see them working on their ancient looms. Day 09 – Today’s visit is to the village of Dhulikhel, an ancient and scenic small town on the Arniko Rajmarg (Kathmandu – Kodari highway). From here one can have a complete panoramic view of the snowy ranges of the Himalayas from east to west. Driving through beautiful countryside, we visit Panauti, a thriving village off the Dhulikhel road, with some very interesting old houses and lovely temples, some of which have particularly fine 14th century carving. Day 10 – Transfer to the airport for final departure.